Halicarnassus, home of Herodotus the historian, was also the site of a famous marble mausoleum—one of seven wonders of the ancient world. Today Halicarnassus is known as Bodrum, in modern-day Turkey. 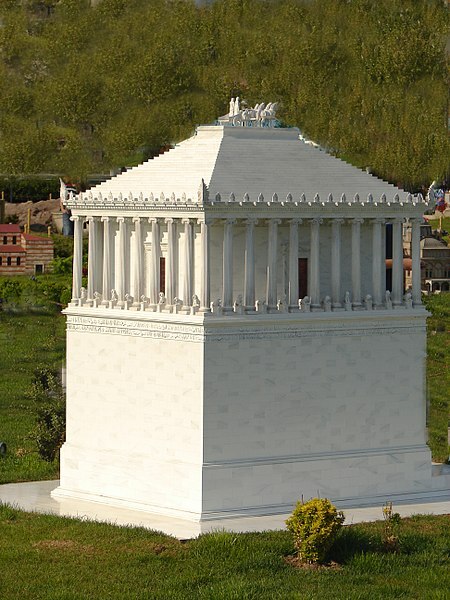 According to legend, a grieving queen (Artemisia) had the tomb built for her husband (King Mausolus of Caria, a Persian-empire province) between 370-350 B.C. The word "mausoleum" is based on the king's name. Halicarnassus, at the time, was part of the territory which Mausolus (also spelled Maussolos) governed. The tomb—which measured about 130 feet high—stood for centuries, but a 15th-century earthquake greatly damaged it. A model of the original structure is maintained at a miniature park, called Miniatürk, in Istanbul. Today, only the foundation (and some pieces of the structure) remain (as depicted in this photo by Carole Raddato, online via Wikimedia Commons and available via a CC BY-SA 4.0 license. Many of the mausoleum's sculptures—such as Greek gods and stone warriors—are now housed at the British Museum. One of those sculptures is a statue which could represent Mausolus himself. This photo—by Prioryman (a Wikimedia contributor also known as ChrisO~enwiki) and licensed via CC BY-SA 3.0—depicts that statue. The image at the top of this page, depicting one of the ancient world's seven wonders, is from Project Gutenberg's e-text version of Ten Books on Architecture, by Vitruvius. Click on the picture to enlarge the view. Image, from Ten Books on Architecture, by Vitruvius, page 55. Bos, Carole "Halicarnassus - Site of Famous Mausoleum" AwesomeStories.com. Oct 07, 2013. Apr 23, 2019.